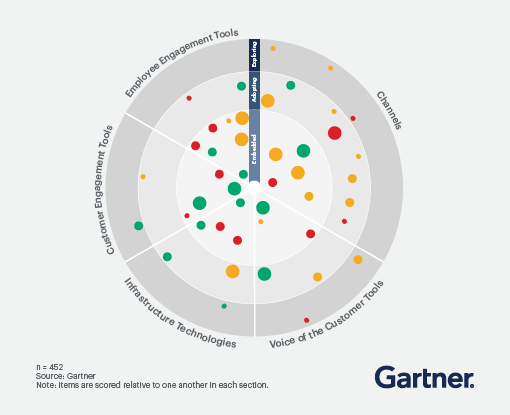 To help navigate the increasingly complex service technology landscape, we worked with more than 450 customer service and support leaders worldwide to create an objective map of how organizations are adopting tools to augment their live and self-service channels, voice of the customer, infrastructure, customer engagement and employee engagement. Current adoption. The location of the circles indicates how embedded each technology is to the service center, in aggregate. The closer to the center, the more embedded a technology is today. Current value. The size of the circles indicates how essential a current technology is to the operation of the service function. The larger the circle, the more value leaders currently see its use. Future importance. The color of the circles indicates how your peers view the future importance of each technology in two years’ time, suggesting the direction of future investment. Green shows that it is expected to be more important in the future.